Parenting is not a competition. So why do we make it so? Everywhere we go as parents we are subjected to it: parenting magazines are rife with it, online forums are immundated with it, shops promote it, even the humble mother and toddler groups are at it. Everywhere we go as parents we are faced with it. Yes, there are milestones that are set for child development. Yes it is good to boast in your child’s achievements. Yes, I am all for buying children lovely clothes and cooking home made meals. We all want our children to have great opportunities, stimulating toys, the best in life that we can offer. What parent does not want the best for their child? But it isn’t a competition! Your child’s new bike does not HAVE to be better than any other child’s in their class or street. Their school uniform will look just as smart bought from the high street chains as it will have from designer shops. And you know what? 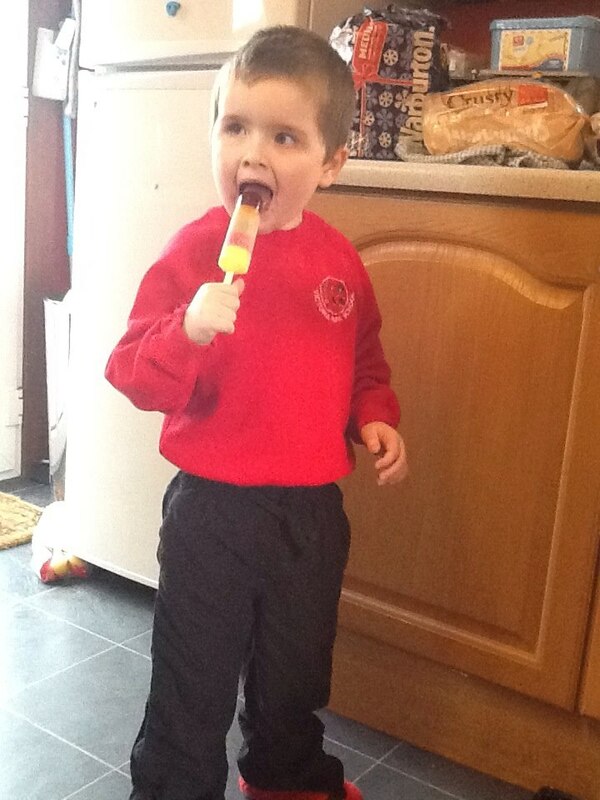 Kids grow out of expensive clothes just as quick as they do supermarket clothing. You really do not have to go into debt to buy your child the most amazing Christmas presents they have ever had. This year my children had many of their gifts second hand, and loved them. Sending your child to an expensive school does not mean your child is better than another child. You are not a bad parent if your children have to walk rather than go by car. As parents we have so much in common, yes, even parents of special needs children like myself. We all want our children to feel loved, valued, respected. We all want our children acheiving the best they can in life. What parent would not wish for thier child to grow up happy and content? We want our children healthy, to have compassion for others, to live independently one day, to have enough knowledge of the world to be able to cope on thier own, to believe in themselves and others and to be a responsible citizen. Our role as parents is to teach our children about life, educate them on values, feed them physically and emotionally, to care for them until the day comes when they learn to care for themselves. There will be times in life for us, and our children, when life will be a competition. But neither we, nor our children, can possibly always win every competition. They won’t always be the best. We need to establish in our children enough self belief and self esteem that our children can cope with this fact. They won’t always be ‘star of the week’ in school but they can be ‘star of the day’ at home sometimes. Even in a large family they can be rewarded for caring, sharing, helping around the house or behaving well. As parents we need to motivate our children to be the best they can. But we need to remember they are children too. I was not a straight A pupil at school. I was average at university. I didn’t pass my drivers test on the first attempt. I don’t even own a house. And as a parent I can not compete with others either. In fact, if you were to judge my parenting on my children’s accademic and developmental achievements I would be classed as a failure. My 5 year old son can not speak a word let alone read or write. He still does not even respond to his name when it is called every time. Neither of my 5 year olds are toilet trained. If parenting is a competition then my score would be very low. But can I tell you something? Something that has been a revelation to me this week? I don’t need to get my self-worth from my children. I love them, support them, fight for them, provide for them, nurse them, teach them but I am not perfect. And neither are they. It would be wrong and cruel of me to try and make them perfect. Or make them compete and deem them to failure. God made me me. A unique individual who He says is fearfully and wonderfully made. He made my children perfect too. And while I will strive to make them the best Naomi and Isaac they can possibly be, I will not compete with other parents in doing so. Because to make your children the best ‘them’ they can be has nothing to do with your neighbours, your child’s class mates, your friends, or ideal families in magazines. To make your child the best ‘them’ they can be means loving them unconditionally, supporting them, encouraging them, preparing them for the future, educating them, looking after thier needs, praying for them and being there for them. When they reach goals and milestones to celebrate with them, no matter when that is. Does it matter if my son does not learn to write his own name until 7 or 8 or even older? 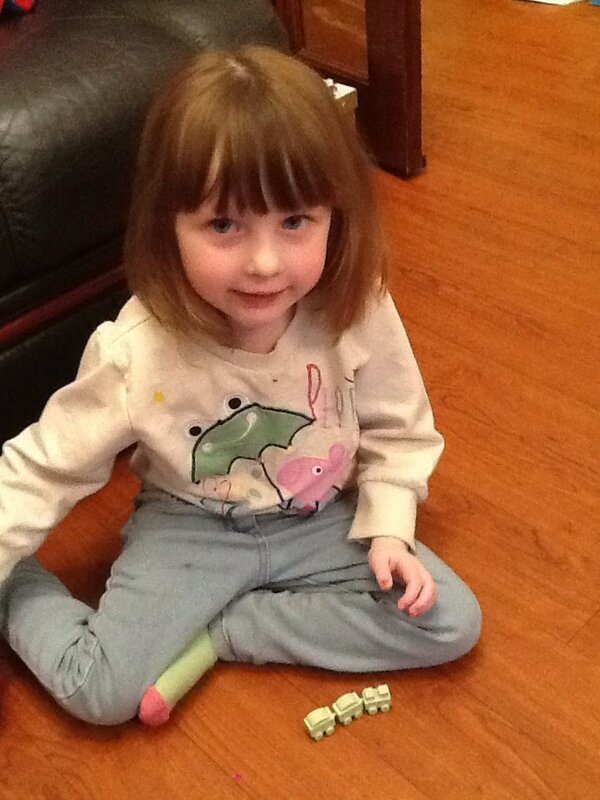 Does it matter if my children do not grasp toilet training until 6 or 7 or never at all? When I am out on the road driving every other driver (other than learners) have passed thier driving test. But does it matter if that was last week, or last year, or forty years ago? Once you can drive you can drive. Has anyone asked you as an adult when you grasped toilet training? I doubt it. Because when a skill is achieved you celebrate, move on and look to the next goal. Fellow parents, please enjoy your children for all they can do and all they are as wonderful, precious, unique individuals. Give them the best you can in life but do it for your child or children NOT to be in competition with other parents. Let us teach our children how beautiful, amazing and special they are for being THEM, not just for being the best at everything and beating everyone else. Competition has it’s place and can be motivating, but when every family is unique and every child different there is no place for competition in parenting. And that goes for competing for the ‘worst’ or ‘most disabled’ child too. It hurts. And it achieves nothing. So let’s support each other, encourage one another, love each other’s children and pray our children grow to understand that they are winners every day. And here are my two winners. 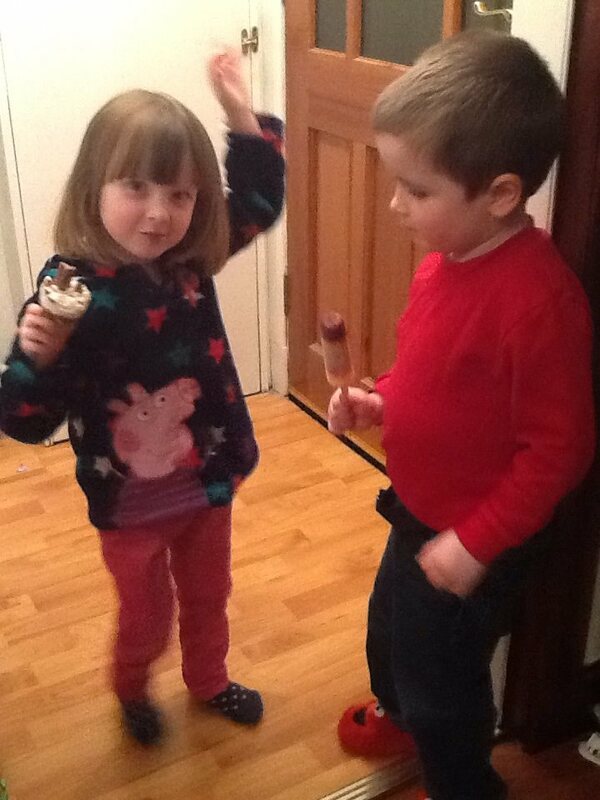 Naomi showing her twin brother how to dance. I don’t care what you think but I told them both they were fantastic! Because it wasn’t a competition. Have you ever waited for something for a long long time, fought for something until you were weary of fighting, or investing your life in something until it seems like it is all that consumes you? I know lots of us have. I longed to have my children for 10 very long and seemingly never-ending years. I have fought for both children to recieve their diagnosis. I have fought for my son to receive the right educational environment to thrive. I have fought for basic adaptations to our home to allow my children to fully enjoy all that it has to offer. I have fought for help and support for both my children. And for the last two years I have been fighting for respite. But with all this fighting, all this striving and pushing and waiting, what do you do when you finally get what you have been waiting for? My children are here now. They are now both diagnosed. My son is in a fantastic school and doing well. 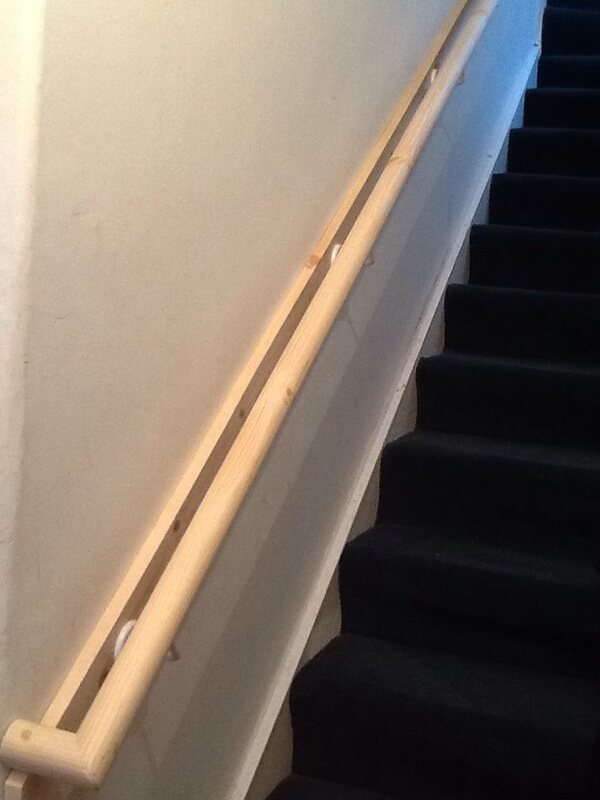 We now have railing and grips on both outside stairs and extra railings on each side of our inside staircase. 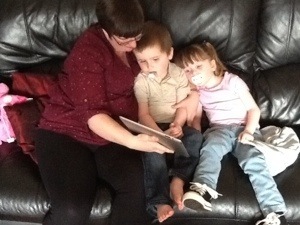 Both children have a co-ordinated support plan in place. And would you believe it…we had a letter this week to say that starting from this weekend BOTH children will be receiving a few hours ‘respite’ each fortnight. 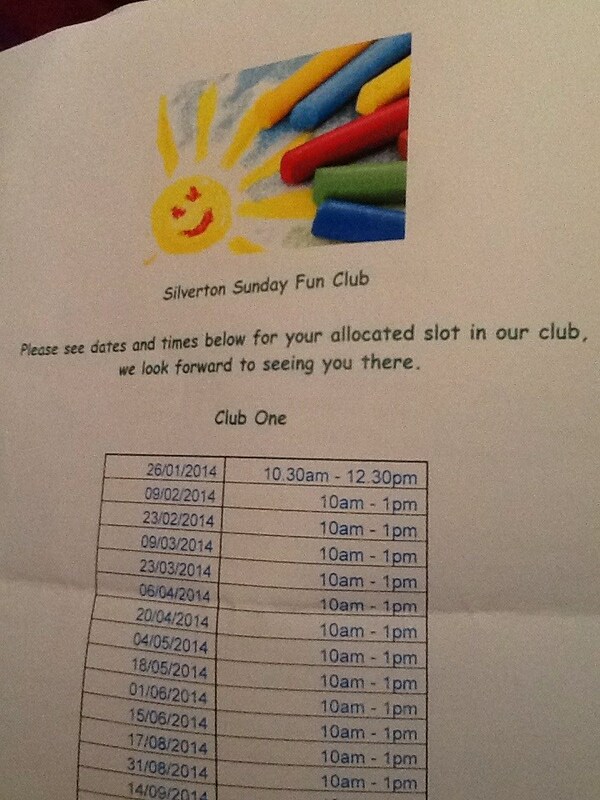 Well, they are calling it a Sunday Club (well we would not want them to admit we actually need respite now would we?) but it is the same thing. This Sunday I get a few hours break. If your child has recently started school, or recently been diagnosed, or you have finally got the answer you have been waiting for for a long time it can be a time of real mixed emotions. Relief, delight, satisfaction, and possibly even joy. But it can also bring confusion, emptiness, a whole lot of questions and a feeling of overwhelming emotions. What do I do now? Where do we go from here? Will this be all that I was hoping it would be? How does this change things? It is ok to want to know more when your child is diagnosed. It is ok to want to frame that letter that says finally they will be getting the right support they deserve or get to attend the right school. It is ok to want to keep that positive pregnancy test when you have wanted a baby for so long, or want to frame the wedding certificate when getting married has been your life’s dream. It’s ok to hold those new house keys in your hand and have a silent moment of thankfulness. But when the initial emotions settle and you are thinking what’s next? Now what? What do I do now? Here’s my advice: Enjoy the rest. Enjoy the not fighting. Enjoy a period of things going good. Let the change settle down. Because if everything was always a fight, always a struggle and always a waiting game we slowly become sick. There will surely be more fights ahead. There will always be things needing doing around the house. There will be something else my children will need as time goes on. There may be things that are not quite right yet. I still need to secure the right support for my daughter starting school. My son is still not speaking. There are always loads of appointments still. I would love another child. But right now I am savouring the taste of victory. It may only be for a few hours once a fortnight. But whatever they call it…it is respite. If you are still waiting for that day of diagnosis, if you are still longing for that baby or husband or new job, if you are still dreaming of that bigger house…keep fighting! Keep believing! Never give up hope! But celebrate the victories as you go along. Because without the fight you never really appreciate the victory. When I leave my longed for, beautiful, treasured children on Sunday I will give them both a kiss and a hug. And I might just kiss the respite workers too! What now? Well who’s putting the kettle on? Yes, my kid has an Ipad! My son is 5 years old. And he has an Ipad. He happens to think it is the most wonderful thing he has right now. He can not speak. He has autism and learning difficulties and neurofibromatosis type 1. He has vision problems. He is developmentally less than 2 years old. But he loves his Ipad. Today that Ipad gave me yet another breakthrough in his life. Let me tell you about it. Apologies if I get a bit emotional about this though as for me this is absolutely amazing: Today my son went into the dentist room for the very first time! So what you might say? Well we have been taking Isaac to visit the dentist for 3 months now. We are incredible blessed with having been referred to a specialist autism dentist who happens to have a practice just 5 minutes from our home. This lady, and her dental hygenist, have the patience of saints. Other than Christmas week Isaac has been visitting the dentist every 2-3 weeks since late October. But until today we could not get him out of the waiting room. You see the waiting room just happened to have two of the most amazing things known to Isaac: automatic doors and a lift! Total sensory heaven to my boy and the two things he finds it impossible to come away from. They have a lure that is more powerful than any magnet, a draw more compelling than caffeine. He just ‘has’ to play with those doors and watch that lift. The dentist doesn’t stand a chance really. Not only are these things so compelling for him but he struggles majorly with transition so finds it traumatic to leave one place to go to another, especially when he is having fun. But today that Ipad saved the day. While Isaac had fun at the doors and the lift I recorded him using his own Ipad. The video was less than 2 minutes but it was enough. When his name was called I started the video, and used the Ipad to lead the way into the dentist room. He was so excited to see himself enjoying his favourite activities he never noticed he was actually transitioning from one place to another. We actually got him into the dentist room! So he sat on my knee and watched his video clip over and over. It was like having the waiting room in the room with him. It took away from the sensory overload of a strange smelling, sterile, busy dentist room with voices of strangers talking. He focussed in on his own little idea of heaven and never noticed my tears of relief. I got my boy into the dentist room. And all because of his iPad! I was able to capture a moment, as it happened, savour the pleasure he was having, and replay it in a way that allowed him to experience the noise, the movement, the excitement and emotion all over again and again and again. I was also able to briefly take some quick pictures with the iPad of the dentist, her hygienist, the room, the chair, even some of the tools. Isaac will scroll through these when he wants to see his video and even though he may not realise it, his brain will still be processing those images. Making it all so much more familiar and less intimidating for him nex time. We can add those images to the social story we have, making it even more personal to him. The technology playing in my favour once more. The iPad has allowed us to take instant photos of things of relevance to Isaac such as our everyday meals, his favourite snacks, his most used toys,people we see regularly and places we visit. Not only can these pictures be printed out instantly but they can easily be taken by Isaac from his viewpoint thus making the world much more accessible to him. He is a visual learner and has no language so photos help him share past experiences with us and give him a means of communication. When he has no access to his printed photos we can simply scroll on his iPad and find what we need. And if we don’t have a picture already there is also the modern gift of google pictures. This has helped his understanding so much and made taking him out much more managable. We can show him where we are going long before we get there. Even if we have never been there before ourselves. Precious shared moments together. Made possible by the iPad. So we use it as a communication aid. We use it to link home and school by sending photos live to his school by email. We use it to develop his sound making by using apps that repeat back to him any noise he makes. We use it to help him make sense of the world around him.We use apps to help his development such as simple 4 piece jigsaws that we can help and guide him to put in place. 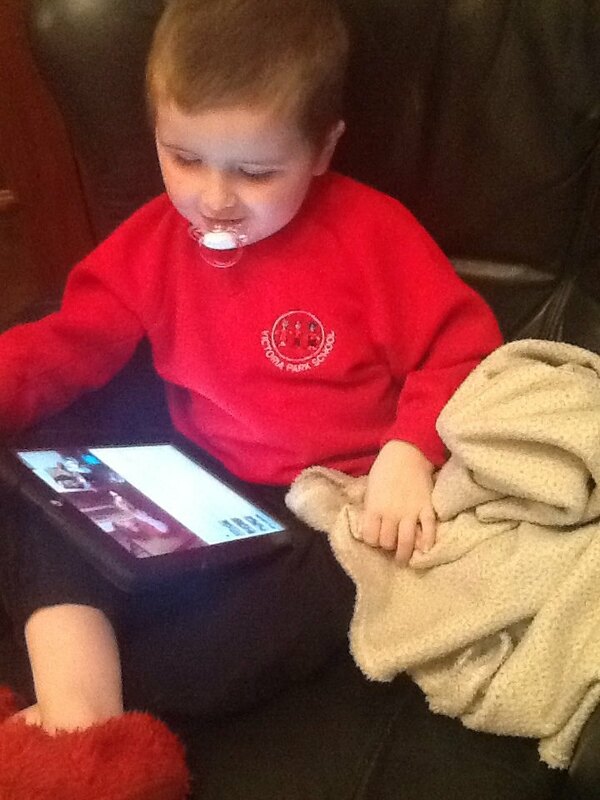 We use sensory apps to give him sensory ‘time out’ as opposed to him having to sit on his own with expensive sensory equipment in his room. 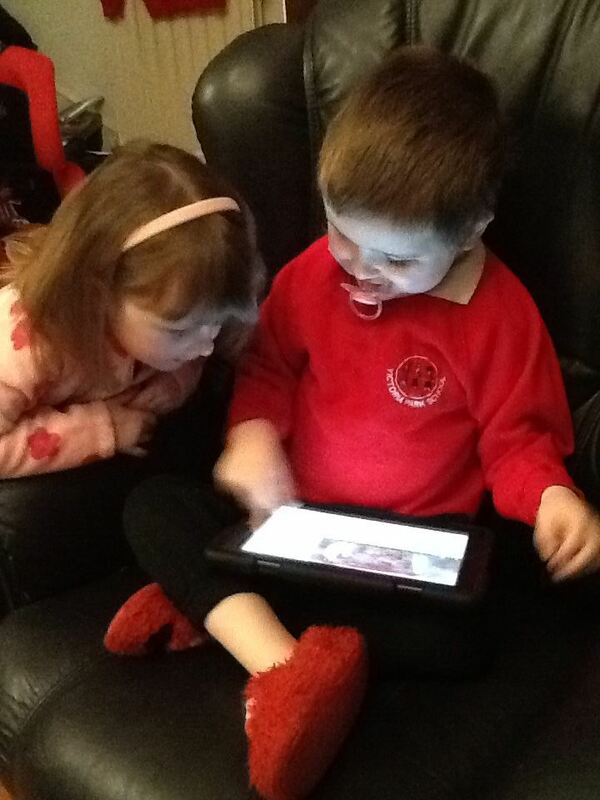 We use match making apps to help him using hand over hand to learn to match and sort. We use musical apps to allow him to express himself musically. We use it as a timer to tell him when one activity has finished and it is time for something else. 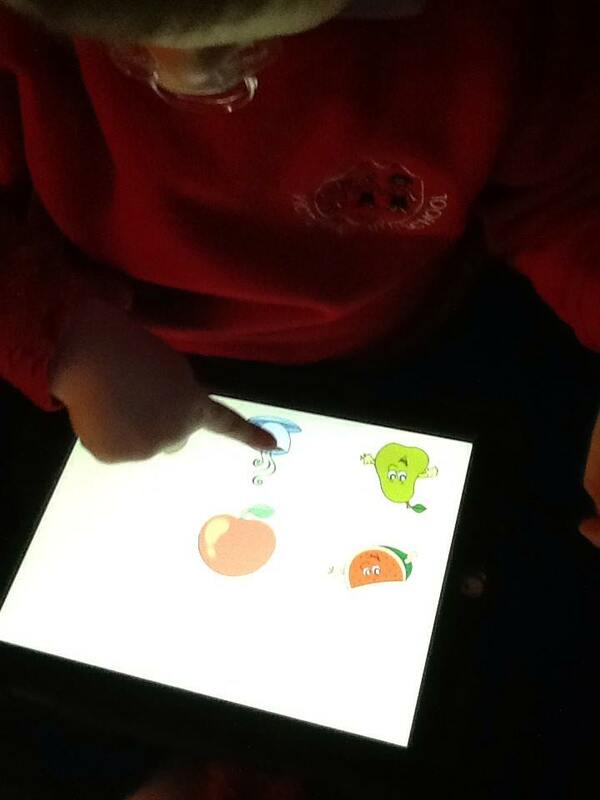 We use art and creative apps to help him learn to mark make. And we let him chill by watching his favourite clips on you tube. 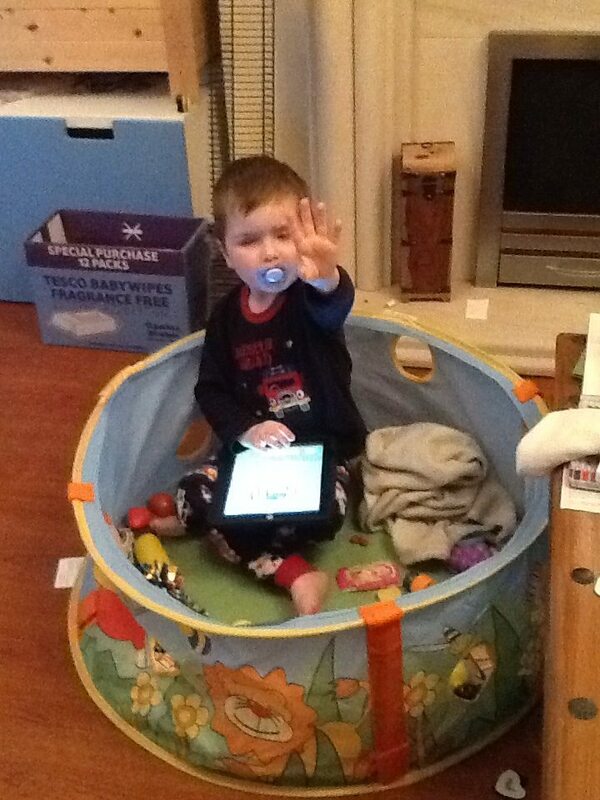 But most of all the iPad is giving Isaac a reason to communicate. Because he still has no idea how to close down an application, or open a new one, or get the next video he wants on you tube. So he has to ‘ask’ for help. 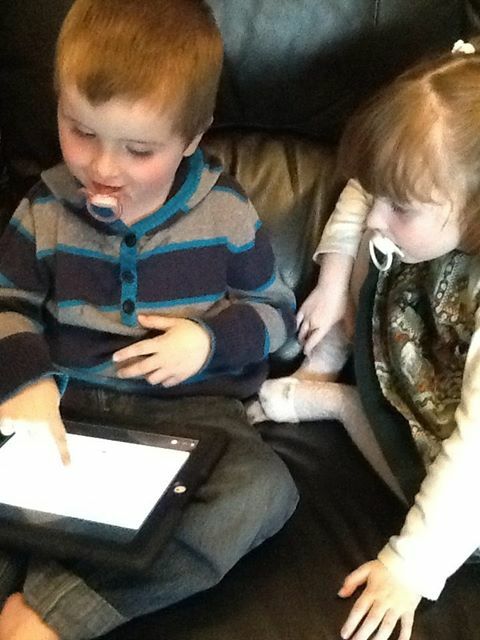 The ipad therefore motivates and encourages him to communicate and realise others can be of use to him. So, despite what many think about it being a solitary activity, for Isaac it is actually making him more socially aware and more willing to communicate. It is a wonderful piece of technology with huge potential. And over time we will be using it more and more to help him develop. Yes, my kid has an iPad. He happens to think it is the most wonderful thing he has right now. Thank you to everyone who helped us collect old mobile phones to exchange for this technology. And thank you to http://www.heartsandmindsphones.co.uk/for making such a difference to my son. She’ll be fine by August? I enrolled this girl at my local school today. For the second time. And for the second time I felt sick. This time last year I had to enrol both children. And I came home in tears. Is the school that bad you ask? Actually it is a fabulous little school with a good reputation. The staff were friendly and the building pretty modern. But I knew without question last year that neither of my children would be going. The emotions of having to enrol your baby for school are high for all parents but for parents of special children having to hear the other parents excitably chatting about how thier children will embark on this new adventure together and have such fun is shere torture. You don’t want reminded how different your child is to others thier age. You really don’t need it to be ‘in your face’ that your child does not fit in. The school were geared up for the children last year giving them stickers and having them talk to staff. It was the same again this year. Wonderful for the children going. Heartbreaking for the families bound by law to enrol a child the school will never ever meet. I enrolled my son at that school last year. But he never made it through the gates. And probably never will. The children would never hear thier lessons if he did because he would scream so loud the janitor would be tempted to call the police. For all it is a wonderful school it is just not the right environment for Isaac. And 12 months later I am still not entirely convinced it is the right place for Naomi. But the law said I had to go down there yet again. Sometimes I really don’t like the law. But this time I thought I would call ahead. Maybe the Head might be sympathetic? Maybe this time I would be convinced this was the best place for my baby girl. After all we had deferred her from starting for a year so surely that has to have made a difference? It didn’t matter of course, because she had left. They did agree to ‘enhanced transition’ and they did say they would attend any meeting before August to help with preparing her. But is mainstream the right place for a child with Naomi’s needs? So clearly her social and communication difficulties don’t count. Her gross motor delay does not count. Her anxiety does not count. And the fact she is still in nappies? 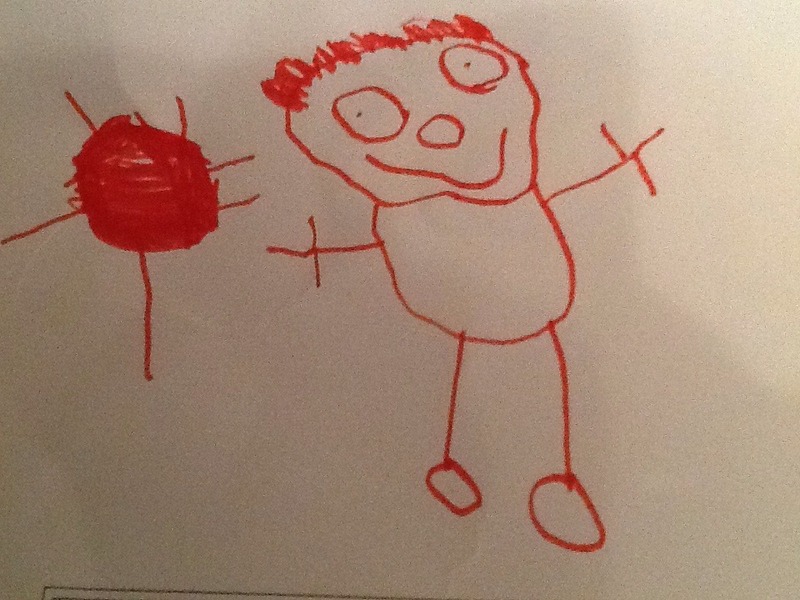 She can talk (at home at least), she can write her name and count, and she drew a picture of herself. So mainstream education is right? She will be fine by August? And here was me thinking autism was a lifelong condition? Why do I sense another fight on my hands yet again for my child’s education? Don’t you worry baby girl. Mummy will sort this out. “Blood mummy. Blood mummy.” she cried just as I was trimming her finger nails. The tiniest nick. But lots of tears. And plenty of blood. If there is something sure to get my baby girl upset it is blood. She becomes hysterical at the sight of it. I just know it will be one of those stories I will hear repeated and repeated and repeated and will never be allowed to forget. But in the meantime I have to clear up blood that is pouring like a river and comfort a little girl who has gone into overdrive. So dad wraps her finger in some kitchen paper. And I get some plasters. “No mummy, not a plaster” she screams.The sight of the first aid box just made her ten times worse. She doesn’t want a visual reminder of her pain. She wants it gone. She doesn’t want anyone else to see her wounds. She just wants to get better. 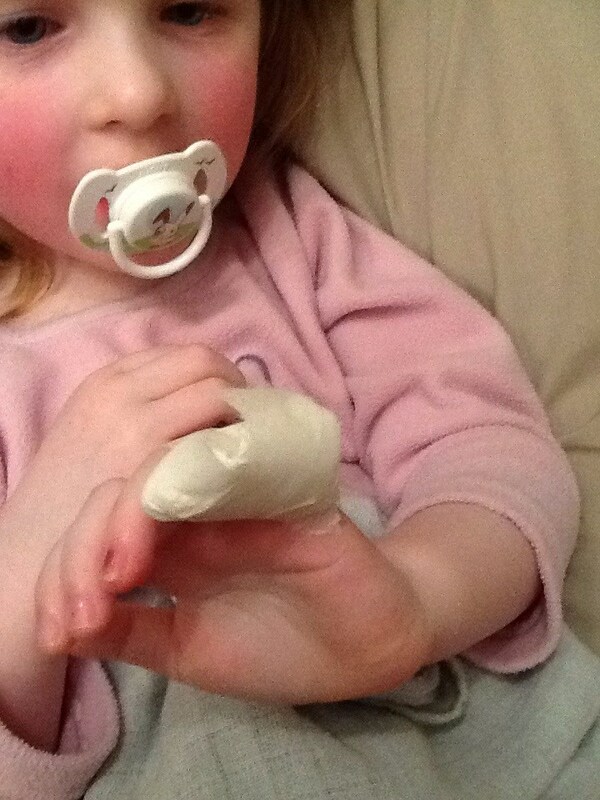 I don’t have time to sit and explain or prepare her for the fact a simple plaster will make it all better. I even try a children’s plaster with lovely pictures on. She pulls the finger away dripping blood everywhere. And the tears keep coming as fast, if not faster, than the blood from her finger. We don’t do unpredictable very well in our house. We do routine, structure, preparation, This isn’t as much the pain that is causing her stress this is the look of blood, the not knowing what we are doing, the people being too close to her, the mass of sensory feelings her body is getting bombarded with. This is fear. This is the thought that things will never ever be better. Plasters don’t work. So mummy held her 5 year old baby in her arms and firmly held kitchen towel over the small but highly distressing wound. To her this is massive. And I understand that. “It will get better, I promise.” I whisper. Slowly but surely it does of course. But her emotions and heart beat and adrenalin need to catch up with reality. That takes time. The comfort of being held and spoken to softly help. She is holding onto that promise. Though she has no visual sign of the reality she is trusting. A little cream, a firm wrapping of kitchen paper and some micropore tape to hold it down does the trick. For now though she knows she is different. She feels that everyone will stare at her. She feels emotionally vulnerable and ready to cry at the slightest thing. The pain is still raw. Her mind can not yet think of anything else other than that cut. Everwhere she looks is obvious reminders of the pain. 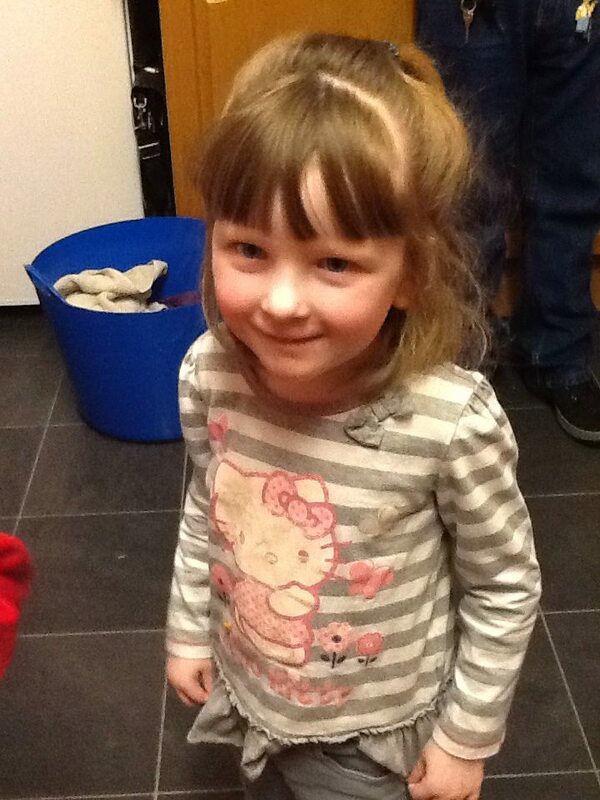 Drips of blood on her pyjamas, on the seat and on mummy’s clothes. Drips that right now seem massive. But to someone who has no knowledge of the situation they may even go unnoticed. I remind her clothes can wash. Chairs can be cleaned. Two bedtime stories later and a little more reassurance and she was asleep. Tomorrow that little cut will be much better. In a few days time it will seem much less dramatic. The memory will be there of course. The trauma will still be there too. But in time that will fade a little. As I promised her, it will get better. And I can promise you things will get better too. Sometimes life is like tonight and suddenly something traumatic and overwhelming happens. And you may not be prepared. You child got diagnosed with autism, your marriage ended, you became ill, you lose your job, your landlord wants to sell your house, there is a death in the family. Life has a way of throwing things like this at us. And just like my daughter when she saw that sight of blood, panic sets in. It is ok to feel like that. It is natural. At first you see the plaster, that visual reminder that something is wrong, and you might panic more. You think everyone will see your pain. You feel vulnerable, insecure, broken. We all feel like that at times. It is ok to cry. When it all seems temporarily overwhemling crying is instinctive. It is part of the shock release. Sometimes it is the pain that is the issue and other times it is the thought that everything has changed, the not knowing what to do now, the sensory overwhelment of it all. In that period of being wounded, of needing comfort, of being confused and emotionally vulnerable we all need the security of resting in someone’s arms. In my times of need I am so thankful for the loving arms of my Father God. Of being able to find refuge in the shelter of his wings. But we need people too. Friends to comfort us and keep reasurring us that it will get better. We need helped. Supported. Loved. You may have to go through a period like my daughter of knowing you are different. I know when my children were both diagnosed with autism I suddenly realised how different life was for me. I thought my ‘wound’ was so obvious to everyone. I felt the pain and hurt would never go away. It felt like everday I was reminded of the fact my children were not like others. I felt like everyone would see that ‘cut’ and ask all about it. I seemed like I was dripping reminders of autism everywhere I went. I felt sad, alone, confused, vulnerable. But time heals so well. I rested. And one day the wound was no longer raw. My children still had autism, just like my daughter still had that cut. But the diagnosis day became a memory. Sometimes, like Naomi, I want to replay it and talk about it. And that is ok. We just need to find the right people to listen. But things have moved on. When Naomi wants to talk about the day her finger got cut I will listen and comfort once again if the momory restirs emotions, but I will be reminding her that it got better. She can’t keep that bandage on forever. It would not be healthy. I can’t keep going back to diagnosis day either. It happened. And things changed. But you know what? It got better. I grew as a result. I learnt, I became more compassionate, and I found new friends along the way too. In the year I have been blogging; In the 13 months since we found out my son and husband have an incurable tumour condition; in the 18 months since Isaac was diagnosed as classic autism, global developmental delay and pica; in the 3 months since my daughter was also diagnosed as having autism; in the 4 months since we found out Isaac is visually impaired: these words have been my comfort, my strength and my hope. Let them comfort you and bring you hope today too, whatever you are facing. I love you and appreciate you so much. Your thoughts, your support and your prayers really encourage me. But I know that sometimes I hurt you because I am not able to come to things that are important to you. I really am sorry. This letter is not an excuse or even a cry for sympathy, but rather a letter to explain my heart and my actions because I realise that things are not always obvious. It appears sometimes that I ‘back out’ of things at the last minute, or I just plain so ‘no’ to things you find hard to accept. I am also much less able to commit than I ever was before. And even when I am at things I am tired, poor company, very distracted and seem pre-occupied and uninterested in being there. My mind and heart are elsewhere. I am a mum. Like all mums my children are always in my thoughts. But the needs of my children are very high. And, although in lots of ways my life is like any other mum, is so many ways my life is very different. Everyday is very stressful and nights are very interrupted and don’t last nearly long enough. I am permanently sleep deprived. So if I forgot about your party invite, or that coffee date, or your birthday, please forgive me. One day runs into the next and my diary is bulging at the seems with appointments for two disabled children plus my own affairs. This year I will try and get the balance right even if at times I only get to send you an e-card and online voucher. It isn’t because I don’t care. It is only because there just wasn’t enough hours today. Or yesterday. Or the day before. Belated birthday cards seem to have been invented for people like me, but even then how belated can I really send it? A week, two weeks, a month? It would be better to send an early one for next year sometimes instead. I do feel bad and guilty at times and even reminders can get forgotten when my child is screaming for dinner and the other requires an urgent nappy change. Please continue to give me grace and patience. And please most of all extend that grace and patience to my children. They both have autism. One of the biggest ways that affects them is in social interaction. There are some major family and life events that it is just not possible or practical to bring them to. Babysitters are very rare for special needs parents and even if I can manage to arrange one there are certain times of day like bedtime and dinner time when my son is just totally unable to accept a change of person. So if your event clashes with dinner time or bedtime for my kids I have to put them first. One days change of routine and change of person can affect both my children for months. To leave the house, even without the children, takes military planning and co-ordination and my mobile phone HAS to be on. And that is why I may seem distant or quiet. And if I do have the children I am even more pre-occupied. To have come to church today or to your house to visit or even to an everyday event like softplay has taken a lot of explaining to and talking to my children. I have probably had to google the place and show my children pictures or I have taken photos in the past. My son will have screamed most, if not all, of the way to the event as we have taken him somewhere other than school. I will have had to remind him where we are going at least ten times. Every stop, be that traffic lights or junctions or slow moving traffic, will have caused further screaming. I will have wondered if we will even make it at least half a dozen times. The event may be close to home but we will still all arrive exhausted. And it will always be touch and go if my son will come in. The lights could be too bright, the music too loud, the place unfamiliar and the people too stressful. But most of all the doors could be far too entertaining, especially if they happen to be automatic! If you have a buffet my son will not understand that social convention means people usually access this after some level of social interaction. We might see people first, he sees food. My daughter sees stress. And even though it might appear I have eyes in the back of my head, I don’t. So watching two unpredicatable and stressed children is very exhausting. If I visitted your house this year and my son caused chaos I am sorry. He used to be fixated with water and would seek out anywhere he could find this. Unfortunataley when you are only 1 metre high the best place to locate this is in fact the toilet! Though this still interests him he is currently fixated with beds and will think nothing of climbing on and under the duvet of every bed in your house. Whilst his twin sister is glued to me and knotting herself around my legs it is hard to truly keep up with her twin brother. I wasn’t being paranoid when I asked if you could lock your doors. It is common for him to escape. And that wasn’t lightening we saw that day. It was Isaac switching lights on and off continually. And yes he did help himself to food in your house without so much as asking. Sorry. I need you to know dear friends and family that this is autism. This is my life. I have tried discipline. I have tried training. We are still teaching him. But this is very real sensory and ritual behaviour. This is autism. And this is why when you invite us round I often say ‘no thank you.’. It is because it is stressful; for you, for me and for my children. It isn’t because I don’t care. It is just easier to stay at home. I am not being anti-social. I am looking to my children’s interests. Weddings, family get together, christenings, parties, family meals and church events of any kind are almost impossible and extremely stressful for me. If I bring the children it is chaos. Or I become invisible all night watching my son playing at the automatic doors or running up and down a ramp or flapping at the lift going up and down all night, while my daughter is hysterically crying for mum. If I come alone I know I am going home to screaming children and one thousand questions from my daughter as to why everything was done differently tonight. Or to a sick child from head banging. So thank you for understanding. Thank you for inviting me to things even when it feels like I never say yes. And please keep inviting us. We might be having a ‘good day’ and be able to come for a little while. We might have enough time to prepare the children or get that rare sitter. Forgive me if I look like I have come in fancy dress as a cleaner. I probably cleaned something you don’t want to know about just prior to leaving home. Or had a handful of baked beans rubbed into my back that I wasn’t aware of. And forgive me if I leave early. I am exhausted physically and mentally. I eat, sleep and breathe my children. So naturally it is my only real conversation topic too. You see they are my full time job, my hobby, my family, my everything. I don’t get out much. Sorry if I bore you talking about professionals, and hospitals and things you take for granted like eye contact. So thank you for sharing your events on social media,by email and in your blogs. I want to see your wedding pictures, your birthday party snaps and your summer holidays. It is like being there but without all the stress. I know you want us there and I truly appreciate that. But sometimes life doesn’t go as you expect. I have two disabled children. I have two beautiful children. I have two amazing children. and they are my priority. Thank you for appreciating that and loving and supporting us. It might be better if I say Happy Birthday, Congratulations, and Happy New Year now in case I miss your events in future. Don’t lose contact. I love texts and messages and even the odd card in the post. I am still here, even if you don’t see me as much as you would like. And I still care and love you all.